Check out our photo gallery of our projects. Fill out this form to schedule a consultation with one of our pool professionals. 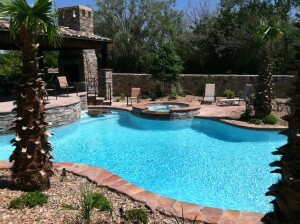 For over twenty years, Joe Beechler and his companies, Paradise Pools in El Paso, Texas and Dolphin Pools in Las Cruces, New Mexico have been enhancing the value and owners’ desire of greater homes in the Southwest. Each of our in-ground swimming pools and spas is custom created for uniqueness within its surroundings, along with the owners’ individual lifestyle and personal taste. We are committed to personal service and customer focus. We personally analyze each pool site and fully discuss all ideas with you to better understand the needs and preferences that will reflect your personality in you new swimming pool and spa. Then we will design and prepare a “one of a kind” design specifically for your outdoor living room. Our construction crew has been trained to transform the paper design into steel and concrete. The crew has constructed all of our pools and has created outdoor beauty and elegance for over eighteen years. They are highly professional and skilled in what they do. However, if a question should arise, Joe or Peggy will only be a phone call away, as we oversee each job individually. We have built an outstanding reputation by focusing on customer service and providing the best quality through every stage of the construction process. We use the finest materials and superior equipment that results in a low maintenance, multi-use balance to your home. From simple to sensational, we can transform your dream pool and spa into reality.